Mr. King serves on a wide range of government, industry and company boards including Chairman of the NZSX listed Southern Travel Holdings. He has been involved in major government and corporate projects in Indonesia, Saudi Arabia, Dubai, Asia Pacific and Australia and honored with an Award of Merit for Tourism Leadership by the Pacific Asia Travel Association (PATA) and the Australian government with an Order of Australia Medal. With a 40-year background in international tourism, marketing and management, Mr. John King is a well-known global tourism identity. Mr. King was awarded the “Travel Industry Newsmaker of the Year Award” for the US early in his career and was recognized by the US Tour Operators Association and the US Travel Industry Association as operating the most effective US destination marketing program while US Regional Director for the Australian Tourist Commission. This was followed by almost 20 years at the helm of Global Tourism & Leisure where Mr. King was involved with global destination and brand positioning projects for major government and corporate clients in Australia, Pacific, Asia and the Middle East. This included special projects in Indonesia, Saudi Arabia and Dubai. 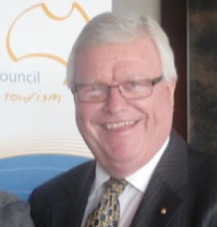 Mr. King was Chairman, Tourism Tasmania for 9 years and Chairman of the Australian Tourism Export Council (ATEC) for 8 years. He continues to serve on a wide range of government, industry and company boards including his role as Chairman, of the NZSX listed Southern Travel Holdings which has operations in Australia, New Zealand, Japan, Singapore and Hong Kong. Mr. King was awarded the Pacific Asia Travel Association (PATA) award of Merit for Tourism Leadership in 2010 and an Order of Australia Medal in 2011 for his contribution to Australian tourism.